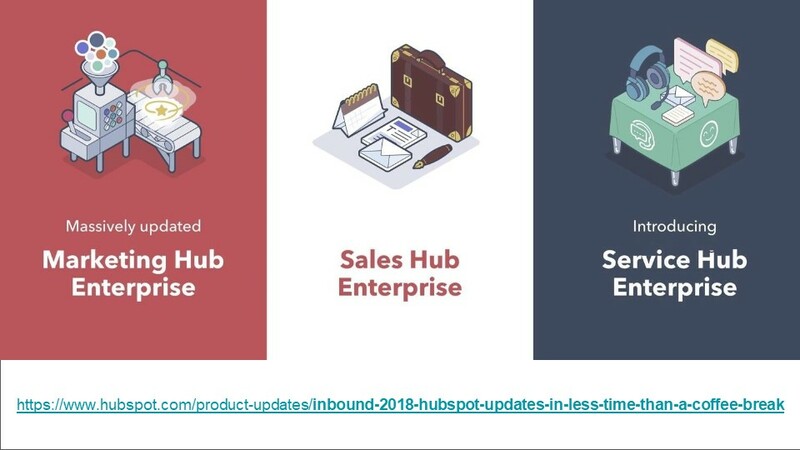 This is a transcript of the talk given by Pete Nichols ,from HubDo, at the HubSpot User Group Meeting in September 2018, in London. Thanks very much and thanks for the opportunity to come and talk to you today. So as Clwyd mentioned. I run an agency called HubDo, we do HubSpot, It's easy. I seldom deal directly with end clients who are using HubSpot, I support agencies actually. I guess if you're doing inbound, you want to know who are the people that you help? So I work with marketing consultants, actually, and sales consultants, who want to do inbound and then they get frustrated or overwhelmed or daunted by what it takes to do inbound, really well. There's a lot of moving parts to get it right. So that's what we do. So thanks for the opportunity to speak about inbound. 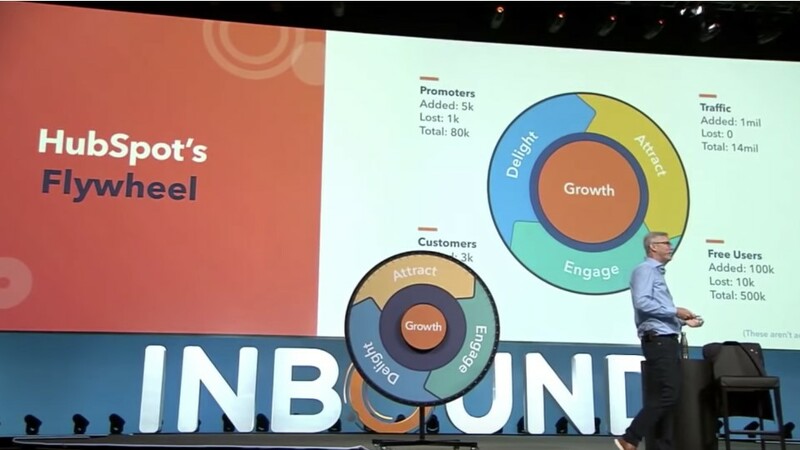 When Clwyd and I talked about coming in and being part of the presentation with Vidyard and with Hubspot today, we had the inbound conference coming up at the beginning of September. So this is an update on inbound.com, which sounds like a website. It's also talking about the event. Who here has been to inbound in Boston before as an event? It's quite a scale of an event. It's been running for several years. My first time there was last year. First visit. So today I wanted to talk to you about what is that event? Is it just a Hubspot Gig? What is it all about as an inbound event? 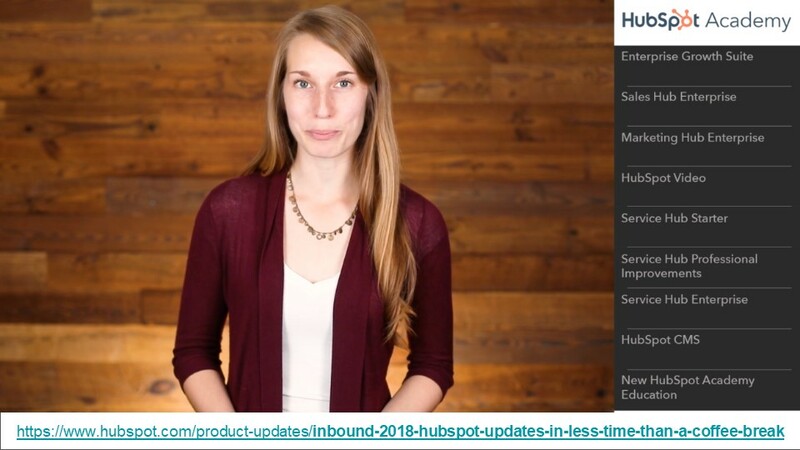 And to talk about what's changed actually, because inbound is not the same methodology that you may have learned a year or two ago. It's evolving because your customers are evolving and you're evolving. So we'll talk about that and then I'll touch on the software changes as well, particularly for the HubSpot users or people considering HubSpot as a platform. There's a lot of new stuff to cover. So I'll get that in in the next half hour for you. So inbound 18 as an event, it happens in Boston in this enormous conference centre. 23,000 people, 330 breakout sessions. So to give you a summary of all 330, we're not going to try and do that. I'll give you an essence of what inbound is really about and what is inbound mean anyway? It's obviously the opposite to outbound, but to be inbound is about aligning your business and what you do with the way that your ideal clients like to research and buy today. And we're all consumers as well. Right? And we saw coming through in this year's event, particularly with the keynote speakers of the messaging around human stories ,because inbound as an event, what it's for, it's about business, but it's really about the human side of business, about being helpful to the customers that you serve rather than just exploiting an opportunity. Outbound would be interrupting people in what they're doing saying, "look at me, look at me", whereas the inbound approach is to deliver value and create pathways that attract your ideal clients to you. Like I do for marketing consultants, I want to deliver value and the right people who need what we do hopefully will find me in an inbound way. But the big change is trust. That's been the massive change, trust in journalists under pressure, trust in politicians, trust in CEOs. So what's really changed is that we don't believe what we're told so much and as readily anymore, but word of mouth has risen to number one. And you'll see that coming through as to what's changed in inbound is that you need people talking positively about you, because we believe the person sitting next to us in the audience, you'll believe them more, most likely, over anything that I say today. That's just how we're changing now. Last year at inbound, the rush to the back of this room, this is just kind of the open area where Vidyard and other vendors are presenting what they do, along with Hubspot. It was a cram of people to the back of this room, to try and get a seat to see Michelle Obama. She was a keynote, you know, one of the main key notes. And of course we all wanted to see Michelle Obama and set in a powerful session where she made 23,000 people feel like it was a fire side chat, talking about the pain of raising teenagers in the White House when Sir Paul McCartney's downstairs and they don't want to come out of their bedrooms and all of this human side of the story of that. So how does that relate to business or inbound? It is about business, but it's about the human, helpful side of business and who you assist. So unlike Michelle Obama, that was a highlight for many of us last year, this is one of the talks that was a highlight for me. So Scott Harrison, who's the head of Charity Water. Anyone heard of this charity before? Some. So he told his story of how he ended up really on the far side of where you want to be. He was a nightclub promoter and so he was wrapped up in everything that that world has, from the money and the drugs and all of those things that entails, until he had an epiphany and decided "This is not where I want to be, I'll go and help, I'll help on a hospital ship". And when he was there, in third world countries, seeing all of the disease and problems that they were solving and a doctor there said to him, "Well, actually, if you can stop people having to drink the water on the left, they wouldn't need to come here under my scalpel. Could you go and do something about that?" So he decided to look into it and realised that a lot of people are born, grow up and die, having drunk the water on the left their whole life and you can imagine putting it under the microscope what it looks like. It's horrible, but it just is what it is. Right? So he figured, "Well, could I solve that?" And part of the reason that Scott was talking is because he approached it in an inbound way. 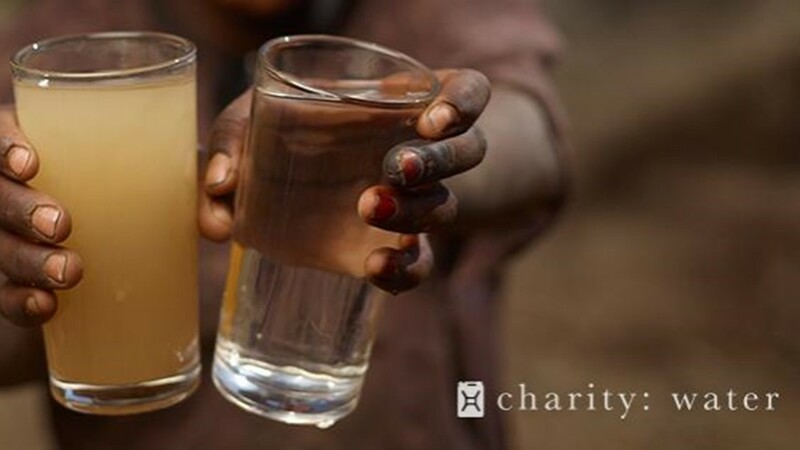 He wanted to help deliver clean water, but he needed money ,as a charity, and started talking about trust, trust in charities as well, "How much of my money is actually going to go to clean water versus being eaten up by the charity?". He learned pretty quickly that people weren't going to readily give, unless he could solve that. So he thought about his ideal client. His ideal client is actually the person who will give the money to solve this problem. So he tackled it in a couple of ways. First of all, which is ingenious really, but very, very simple. I guess the best ideas are really simple. So what he did was he separated it ,almost like into two bank accounts within the business, the bank account to run the business, to pay for the officers and the wages and all of those costs associated -every cost for running the charity- and went to celebrities and other philanthropists and got that fully funded. So no need for any money there at all. And then just focused on raising the funds ,so he was able to overcome the trust of separating those out. And then if you are giving to this charity, you receive information about the GPS coordinates and the village where the tap is that you've helped pay for. Where a million dollar rig, came in, drilled, created water and now 300 people in that village don't have to drink the water on the left anymore and you can look up on a web-page to see how many litres of water everyday flowing through to the village that you've helped. Really simple, but very inbound and very powerful. He told a lot of personal stories mixed into this and he had a room of 23,000 people in tears, about this, which was really powerful. But I wanted to convey to you that this is what inbound is. A lot of the breakouts, yes they do go into the depths of what's new around Facebook ads and custom audiences and all of those associated technicalities and CRMs and so forth. But this is all about the human side of it. So he was able to explain how they've successfully so far helped eight point 4 million people go from drinking the water on the left to the water on the right. And then he talked about the fact that he's got another 663 million to go. So he's just got to do what he's done 79 times and he'll have solved it, but he'd really like to do it in his lifetime. So he was appealing to the audience to how they could help the cause. So this was the Michelle Obama talk for many of us this year, but the lady behind Grey's Anatomy, many story writers, because we love stories. 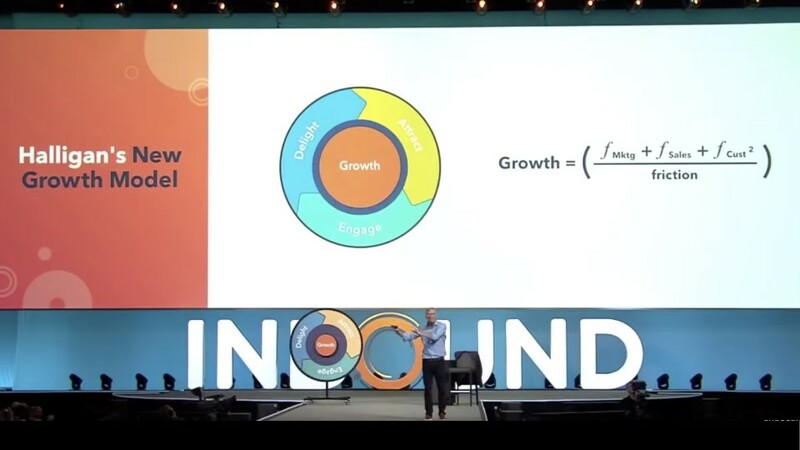 So inbound was really about stories and of course you'll hear from Michael ,with stories moving to video, of how critical that is now as well and why HubSpot's integrated video into the platform by default. So the message was "Grow but grow better". I love what inbound attracts. It tends to attract people who like to help. 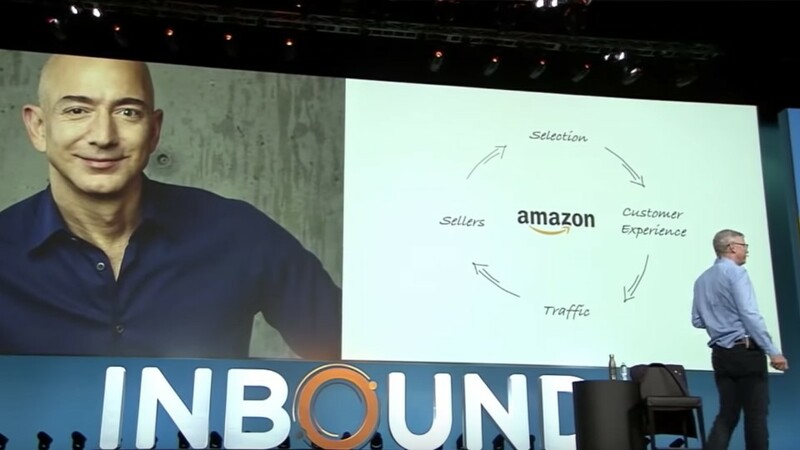 So as a symbol, as what inbound was about from a business context of what's changed in the inbound methodology. If you've learned the inbound methodology because you know there's all these procedures you can apply to your business and say "We want to do inbound, so we need to do attract and convert and close and delight and we want to take the inbound persona into account of the customer journey" and all of these elements. So there's models you can apply, right? To say, "Well, yeah, if we do those things then we're being more inbound. But now there's this thing, this wheel, because what we've heard this year was the death of the funnel. Somewhere in your offices, if you're involved in marketing and sales, you'll have funnels drawn somewhere, you'll have people moving through a process, conversion rates of turning inquiries or website visitors into leads and nurturing those leads, hopefully not pounding people with email automation, but probably doing something to keep them connected, working with GDPR ,to make all of that still work in a customer friendly way. But now there's this thing. So I'm going to spend a little bit of time talking about this. This is the Flywheel. Brian Halligan and Dharmesh Shah, the two co founders of HubSpot. 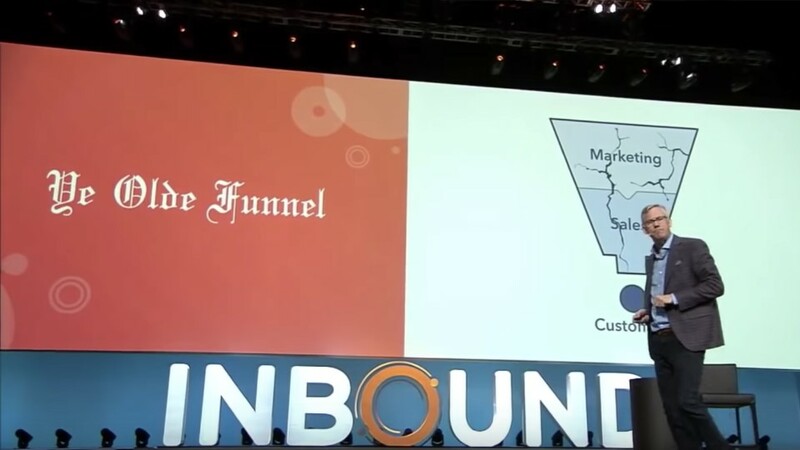 Together they published a book in 2009 called in"Inbound Marketing" and that really explained why they built the HubSpot software, was to allow businesses to do inbound marketing. You don't have to have HubSpot to do inbound marketing. You can use Salesforce, Marketo, you can pick what you like, but applying it in an inbound way. So Brian talked about Ye Olde Funnel, of how the funnel isn't a great model any longer, on its own. It didn't go away completely. I'll talk about where it still fits. But if you look at the funnel, this basic model behind Brian, it has marketing and sales, and then the customer pops out the bottom. Now, if word of mouth is the number one thing that would bring leads into the top of your funnel, that's broken. That's fundamentally the reason to move to the flywheel. So we'll go into that in a little more detail. Now, Brian didn't come up with the flywheel idea, but what HubSpot are great at is methodology, so take an idea that somebody else is doing, but turn it into something that you can take back to your team, take into the business and say, "I think we should do this", and he delivers the tools and the software and the methodologies to do that. So let's have a look at what he's done with that. So Jeff Bezos ,from selling books to selling anything that he likes really, describes his business as a fly wheel in a circle because he's got multiple suppliers. He has a lot of choice. He works on fantastic customer delivery, whether it's by drone or whatever it is. He's thinking about you as a customer all the time, but not as an end point that drops out the bottom. That's just the beginning of the journey. His flywheel is getting larger and heavier and faster. And right now I guess there's no sign of that thing stopping. So Brian really latched onto that concept and then worked away on it for awhile to come back to Inbound a month ago, to present to Clwyd and I, and those who were there, what this looks like. So he created a flywheel. Taken what was the inbound methodology of attract and convert and close and delight into this continuous circle of attract and engage and delight. So, not rocket science, but it's a simple idea and the more time you spend on it, the more powerful you realise it is ,that it actually does change things at a fundamental level. It's changing things in our company as well at HubDo. We're looking at how we apply different thinking, using this. So how does that work? Well, it's not just that it's a circle.It's really important that it's a flywheel. You may not be 100 percent clear on what a flywheel is, unless you've opened the gearbox of an engine before or you're involved in space, so GPS positioning and so forth. That's a flywheel, the heavy disc in a spinning bike is something that I just woke up one morning and thought ,"Actually that's a flywheel that everybody either has seen or could relate to", because although the bike doesn't go anywhere, the wheel itself is quite heavy and so when you start to push on the pedals, it's a little hard to get it going because of the weight of the wheel, but as it starts to go, it builds momentum. So in fact it would take a bit of energy to suddenly make it stop, because like Amazon, that weight is like a stored energy, being unlocked, and the bigger and the heavier the flywheel, the harder it is to stop. So this is the change in the thinking, is to think in a fly wheel. But there's two other really important parts of the analogy here, for this guy peddling. The wheel wouldn't do anything on its own, unless you had force. So simple ,here we're applying that to a bit of pedalling, but in your business, your force is coming from people being attracted into the business. And also what's happening within the sales funnel. 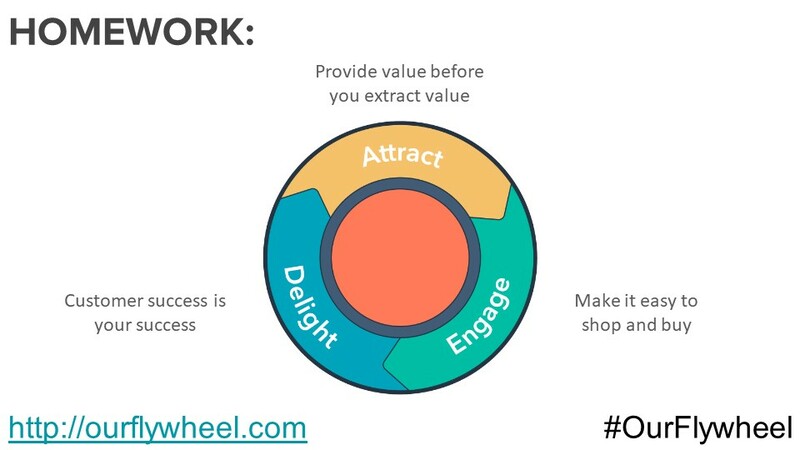 If there's a really positive sales experience that's supplying positive force to the business, but on the delight side, if you've got people who love what you do and they're telling their friends about what you do, that is all positive force to your flywheel ,so the pedalling here is the positive force. And then there's that pesky plus-minus knob that's sitting there on the frame, where you can make it harder for yourself by adding friction, by tightening that up. Your Business has friction today. Every time a customer says, "Well, I thought that was going to be delivered on Monday, and now it's Wednesday. ", it's friction. So we'll talk about adding positive force and removing friction. And if you can do those two things right, your flywheel gets bigger and heavier. Really simple, but really powerful. And it's still inbound because we're still attracting and delighting. So what has Brian done? In taking this and giving you the tools so you can not go back and talk about exercise bikes with the team, but actually do something that relates to your own business. So we're shifting from a better product era to a better customer experience era. So customer experience, CX, it's been a big thing for some time. How do we delight our customers better? So here we're doing it instead of with a funnel with a flywheel, so we can create some forward motion, put some stored energy into this thing. So Brian talked about moving from this funnel, which is full of friction to a fly wheel, where you can try and remove as much friction as you possibly can. And so he's come up with a formula for it. Growth is making your flywheel bigger. So the tools I want to make you aware of, if you haven't gone and watched the keynote, you can watch Brian's presentation on YouTube. If this is interesting to you, I'd encourage you to do that. It's very good and brings it to life. What Brian's done, is measured the flywheel for Hubspot of working out where's all the positive peddling going on on this wheel, from attracting people to Hubspot by offering tools that may help them, just being a helpful company, offering the HubSpot software for free at it's most basic level. So you can just kick the tires, try it out. These are all ways that they're adding positive force to the flywheel. 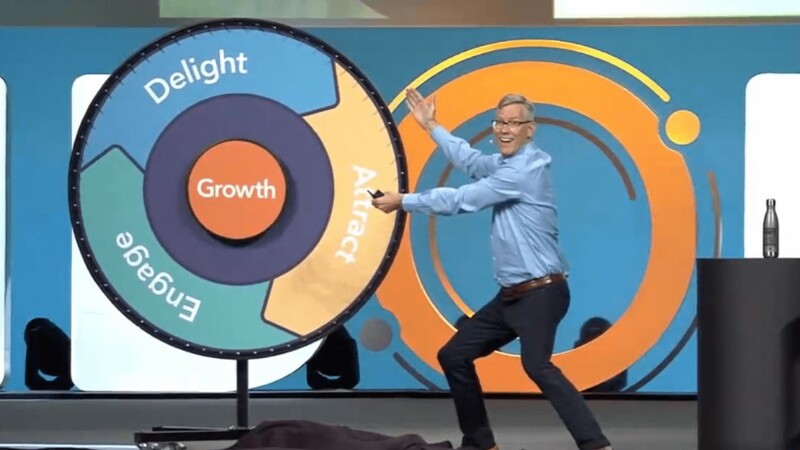 Now what's happening on #ourflywheel is that Brian's got people, who were in that audience, where they're showing the shots of their white boards, they've gone back to their offices and they're brainstorming, "Where's our positive force in our flywheel, how could we add more positive force? Whereas our friction, how could we remove it?". So he's began a conversation and now there's the sharing of those flywheels. You can already see examples of how customers are applying that thinking to their own business. So, he gave us homework. You're free to take this as homework if you like from today, as well as a takeaway with the flywheel of measuring your own flywheel. 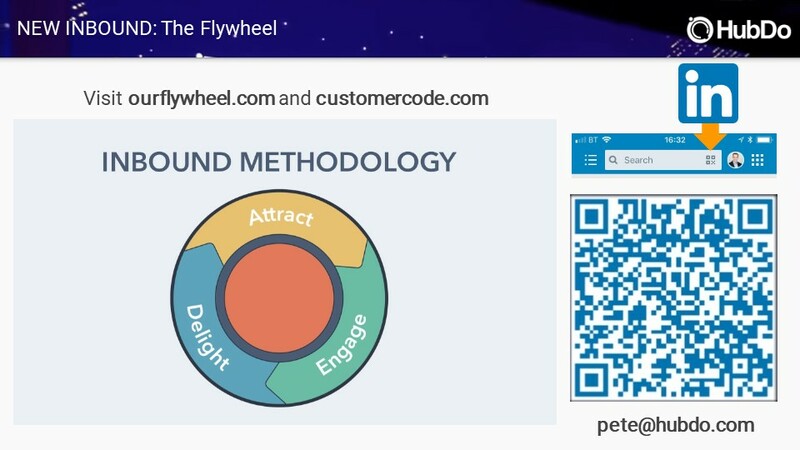 ourflywheel.com is a website, that gives you the explanation and the link into a HubSpot academy training course, that you can just sit through, it's only short, but it does a much better job than I of explaining how this came about and gives you the tools to use it. You can download the slides, do your own flywheel. Then it's Dharmesh. So Helen who really runs HubDo, who's back further in the audience. 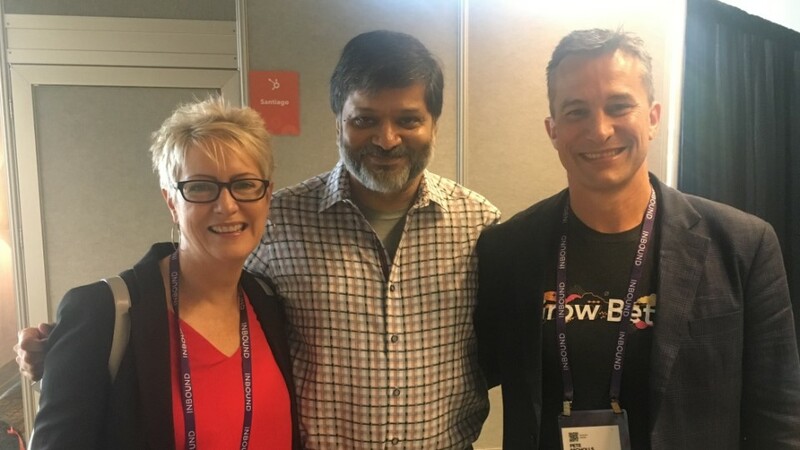 We got a chance to catch up with Dharmesh. That's the nice thing of going to inbound, it's pretty much everyone from HubSpot that we want to catch up with is there. Dharmesh is a cofounder, hates standing up and presenting, but he'll do so because he has to. And I think Dharmesh is the heart of HubSpot to me. 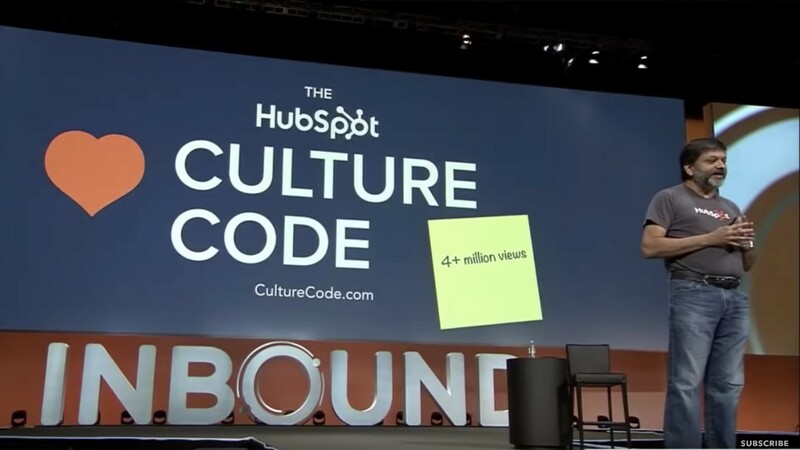 Dharmesh talked about the HubSpot culture code. You might have even read this, it's had like 4 million+ views on it. He spoke about what Huspot's own culture code is, that attracts them. They've just been voted number one place to work for, in the world. Congratulations. I mean as number one of a pretty competitive space is incredible. 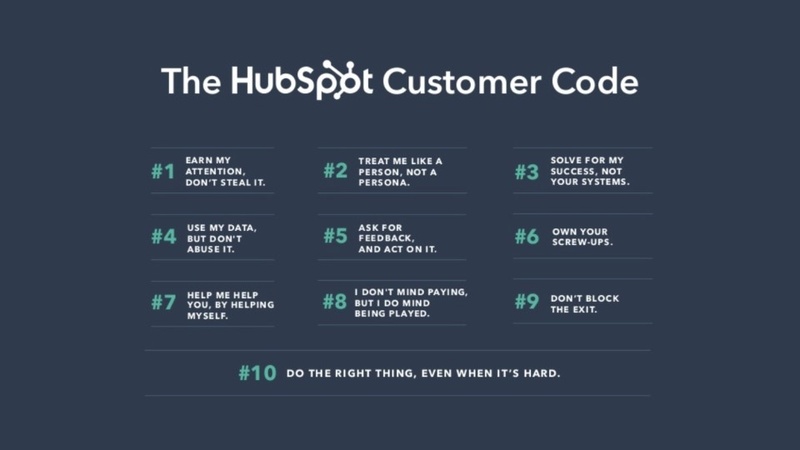 So the culture code is a big part of that at Hubspot. We hang around a lot of HubSpot people and they're good people. So from the culture code, what Brian zeroed in on though, is "solve for the customer" is part of the culture code. Solve for the customer. So Dharmesh is looking at, "Well how does this apply to the flywheel? Are we thinking about ourselves too much? Because I think as businesses we might say we're customer centric, but quite often we're actually self centric. I'm customer obsessed, can be a little self obsessed, might not be your business, but I'm sure you know businesses that don't quite act in the way that they say they do. ". So what Dharmesh has done, think of that plus-minus knob on the exercise bike, the friction, Dharmesh developed a customer code. So, from the code, that was more about the internal staff at Hubspot, the customer code is more about you and in true engineering fashion, he's come up with a few measurement points and tools that you can use for this as well. So he talked about five of the nine measurement points of removing friction. I love how some of these are developed and he whittled it down to nine. One of these is "Earn my attention, but don't steal it". So if I sent you something and I said, "Could you please read this?" and it's going to take you 10 minutes to read it, have I sent it to you because of you or have I sent it because of me? And if you're going to waste 10 minutes on something and think, "Oh yeah, that's 10 minutes of my life that I won't get back. ", I've stolen your time. 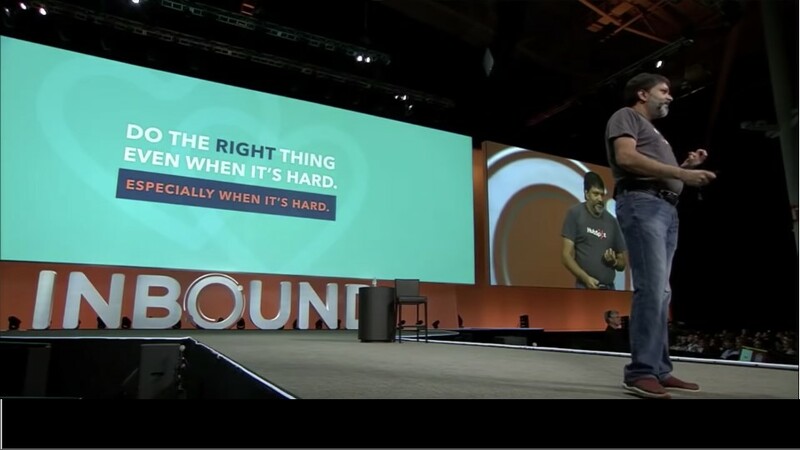 So inbound thinking is adding more value than you're taking away and not stealing time. 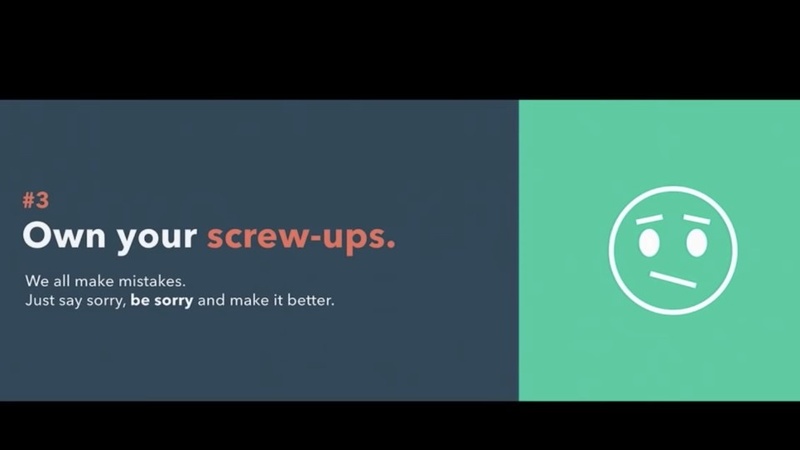 Another really good example was "Own your screw ups", which was really interesting because at Inbound Hubspot had a trip up with some of their software and had an outage and then needed to come out and own that screw up right there and then, so it was very timely and I'm sure it wasn't planned. "We all make mistakes, just say sorry and make it better." 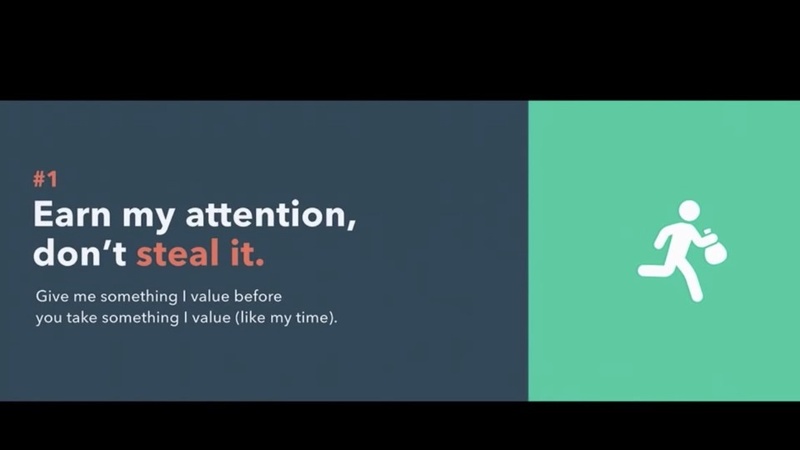 Because on the previous slide where we talked about stealing time, statistics were that 86 percent of people, if you get an unwanted outreach from a company that your view of that company degrades.To be interrupted is not viewed in a positive way. Owning your screw ups, if we admit when we've made a mistake and just say sorry, the opinion of the company goes up, it's highly likely that you keep using them. He gave a really great example of Kentucky Fried Chicken or KFC, when they ran out of an important ingredient, which is chicken. So they ran a full page ad , which is this, which is just brilliant. And the headline is "We're sorry"
So own your screw ups. Say, "Hey, we made a mistake and we're really sorry and we'll try to not let that happen again.". Really simple stuff. This is taking friction out because, yes, sometimes they may run out of chicken again, but they've reduced friction by just owning the problem. And approaching it in that way every time. So there's nine separate measures I wanted to share. I'm not going to go through them all, just wanted to share a couple of those. Number 10 is "Do what's right even when it's hard". So I'll give you the links of how you can get to the page where all this information is and think about it ,because again with the HubSpot producing tools and methodologies, so you can go back and have a think about this for your own business, is the scorecard. So what Dharmesh has done to start is to score themselves, Hubspot scoring their own customer code. How are we doing on these scores? So right now, giving themselves a 7,1 . So good, room for improvement. And this gives discussion points on each of those points, that Dharmesh felt for the customer code, was really helpful. So I thought there's two really good tools. At Hubdo, we're looking at both of them, the flywheel for positive momentum and the customer code to remove friction. 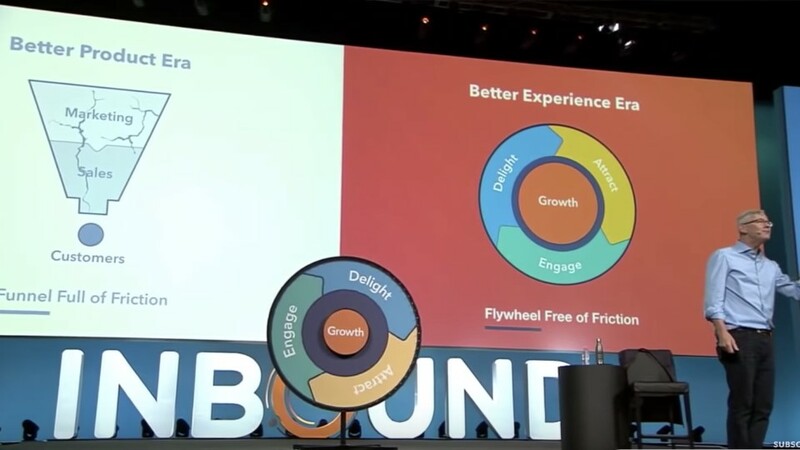 That's what's really different about inbound to me, if you did the HubSpot academy course and you are certified in inbound, you'll find that the new inbound certification is all about the flywheel, as a methodology for inbound. So if you haven't done it, it's time to update and like I said, you don't need HubSpot software to do inbound. It's more of a mindset and approach and the software tools are there to enable you, if you're using HubSpot. 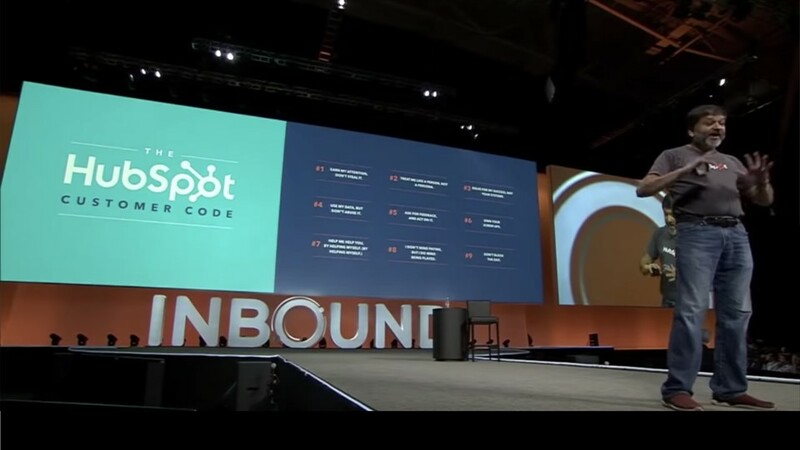 The point of Hubspot is to allow you to do inbound, because it's built with that in mind. So as Dharmesh said ,"Do the right thing even when it's hard and in fact, especially when it's hard, just own it. " 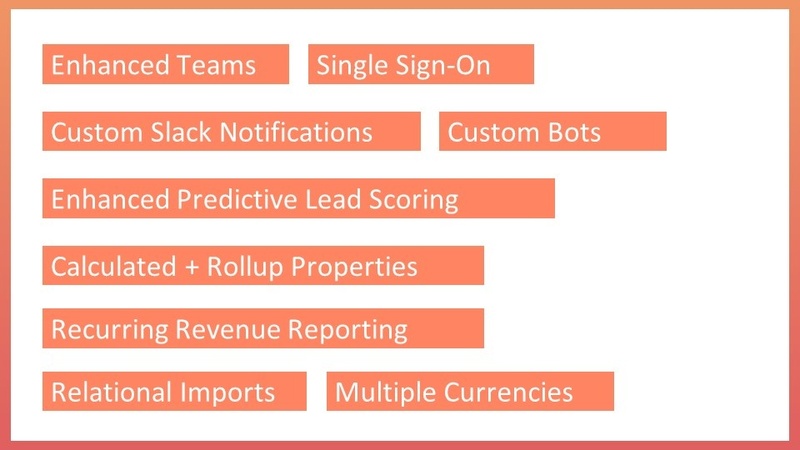 So let's switch gears and just spend a few minutes on what's changed in the HubSpot software platform. 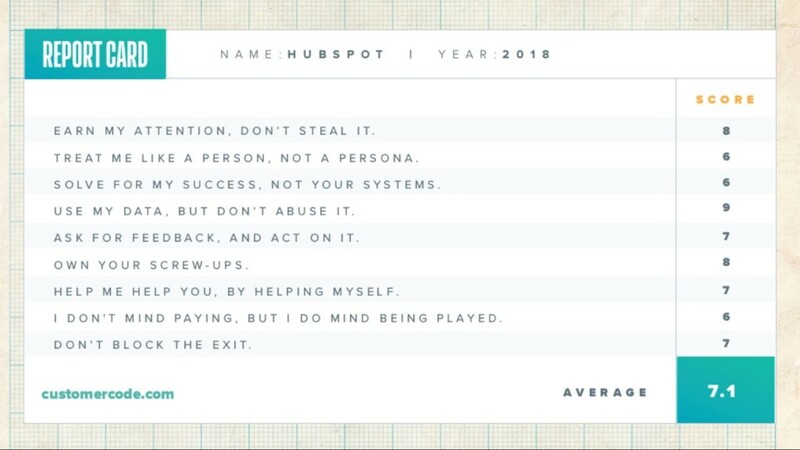 So for the HubSpot users in the room, you're probably aware of some of this already. Hubspot folks have released more software in the last six months than in the last six years. It's been a massive R&D wave and for those of us in the agency world, to understand this, work out where it fits and then advise people correctly on it. Yeah, there's a lot to keep up with, but wow, it's a really, really good stuff. What has happened, of course it's no accident. Here, you've got the flywheel represented in software and you've got it scaling up. So in the centre is a free CRM where you can kick the tires and play with HubSpot. There's even free versions of the software around it, the marketing hub and the sales hub and the service hub. So, Stephen Higgins from HubSpot's going to talk about the service hub and there's a lot of new developments in that area. But the idea here is that the software can grow with you. So if your flywheel is small to start with, particularly for a startup, you maybe don't need a huge amount of software or tools and resources. 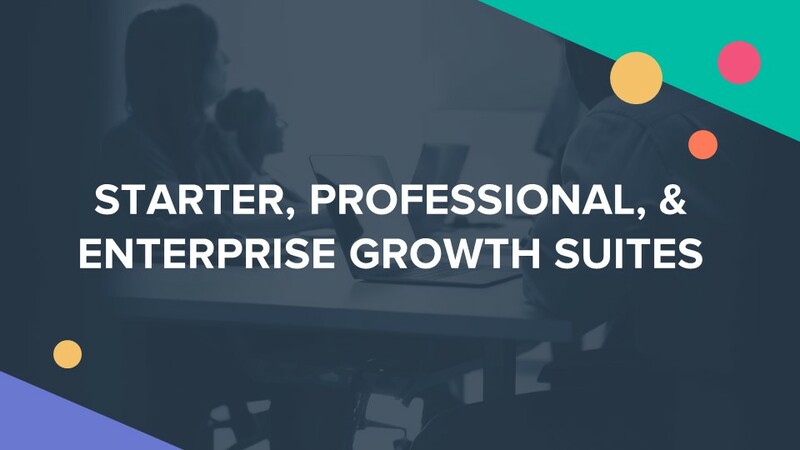 But if you grow and grow and grow, like if you go to like Vidyard with Michael, of growing and growing is that you want the software to be able to grow with you. And so now the circle has been completed by all of the things that were released to fill in the gaps, a month ago, is that you've now got marketing and sales and service hub at a starter level, at a pro level and at enterprise level. So the concept of it, just think of the flywheel growing and the software can grow to suit. So I'm going to step you through some of the updated software features. When I downloaded a slide deck to be able to update you, it was a slide deck that was a rapid sequence of screenshots of software features. And I didn't want to inflict half an hour of that on you. What I want to do is give you the key points of what's in the software releases and then where you can go to find out a bit more about what's most relevant to you. So starter, professional, enterprise, those are the three levels, as the software scales up. Enterprise in particular, a lot of development in the enterprise space and also the concept of buying all three together in a growth suite. And this is a really attractive way. I don't know, how long does this is going to run for. There's no published end date. Right now, a good option to look at is to get marketing hub and sales hub and service hub either all at the starter level or all at the pro level or all at the enterprise level and get a 25 percent discount on the whole lot as a perpetual discount. So it's a really, really good deal. 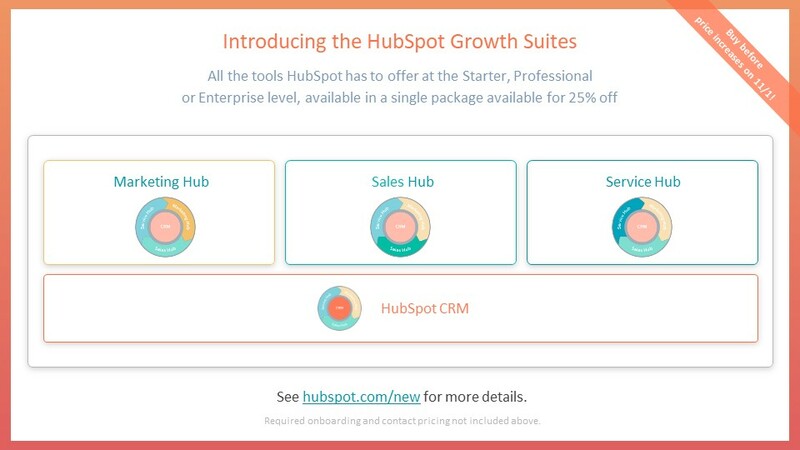 And then, the HubSpot CRM has now been made available, standalone. So the CMS itself, if you're compare it to, I guess at a basic level, the likes of WordPress and so on up the line of different hosting of your website, the CRM part is free, but the ability to host your website, and the CMS actually, is now available separately. So I'm just, I'll touch on that as well. But let's step through what's changed. New and improved enterprise products. I've taken the headlines of what would have each been an individual slide with screenshots of features added across the platform. A really rich set of features across that and keeping in mind going up to an enterprise level. If you've got large teams, you need enhanced team control, because you need hierarchies of teams, of sales teams that roll up into geography teams like EMEA versus North America versus APAC you need the ability to structure your teams. So that's really been beefed up. And single sign-on has been added as well, so you don't have this whole separate log in part to maintain as an enterprise, to tie that in if you're big users of Slack, that's been built in. Bots, no secret that that scenario is exploding, but the customisation within the bots, a ton of R&D in that space and much more to come as well around artificial intelligence. So at an enterprise level, very customised writing of bots. If you have an internal dev team, they can go crazy on this stuff. The predictive lead scoring has really been ramped up using artificial intelligence, to look at customer behaviour within the software. Calculated properties ,where you might want certain multiple properties that are in the database for your customers to then calculate maybe some other metric that you use in the business. That's really handy. We're already using that. And recurring revenue reporting. If your business is a monthly ongoing, then a sale isn't just a sale, it's a subscription model. So that's in there now as well. Relational imports is bringing in multiple objects. 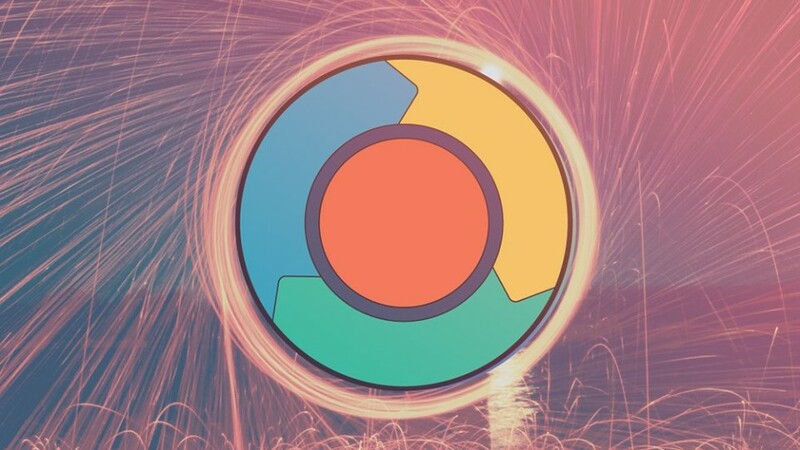 If you're moving from another system into Hubspot, you've now got the ability to import these other objects and the linkages between them, really important because you'd never want to lose those associations, just by migrating into this platform. And multiple currencies. Fantastic. I mean that's, that's already been a boon just for us. We're only a small business, but that's solved a lot of headaches around handling currency. So that's across the platform. I'll touch on some specifics that relate to marketing and sales and I'll leave a Stephen to cover the service hub with you. So in the marketing hub enterprise and sales hub enterprise, I've got a link to this at the bottom. It's also on my last slide and there's a whole update of detail you can get in less time than a coffee break, it says. So in marketing hub enterprise, I've collected another batch of screenshots together, that would have only been readable in the front three rows anyway. To give you the key points that, if you're a HubSpot user to consider that this is helping you. A lot more analytics filtering within the platform and in terms of enabling your team to do social posting. You've got permission levels as to who can craft messages, who can post messages within the platform for social or social advocacy shows great ROI. You know, I see businesses like SAP, Panasonic, others, getting amazing results through social advocacy. So having those sorts of tools really helps. Content partitioning out into a geographically spread business that is in different languages as well. If you've got a team that is working on the French pages and another team that's working on the German pages, how do you do that without tripping over each other? So important divisions there for enterprise. Send Frequency Cap is as it sounds. So you're not accidentally blasting one customer because multiple departments are all emailing them. So just dampen that down with a cap. Membership Driven Content. I could see this also becoming really valuable in the service hub side where you can make pages of your site only visible to certain people, because you might want certain information that only your existing customers can see, not the public for web access. So making that easier. Youtube integration, embedded into the enterprise platform as well ,to see your YouTube metrics within your marketing data. 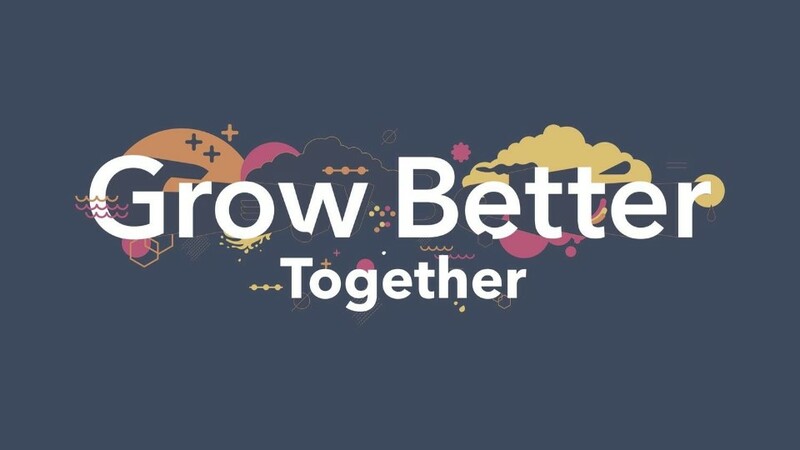 And continuous optimisation of the split testing and conversion rate optimisation, that I'm sure some of you are doing that or maybe have a team to do that, there's tools to help that in a continuous artificial intelligent assistant way. 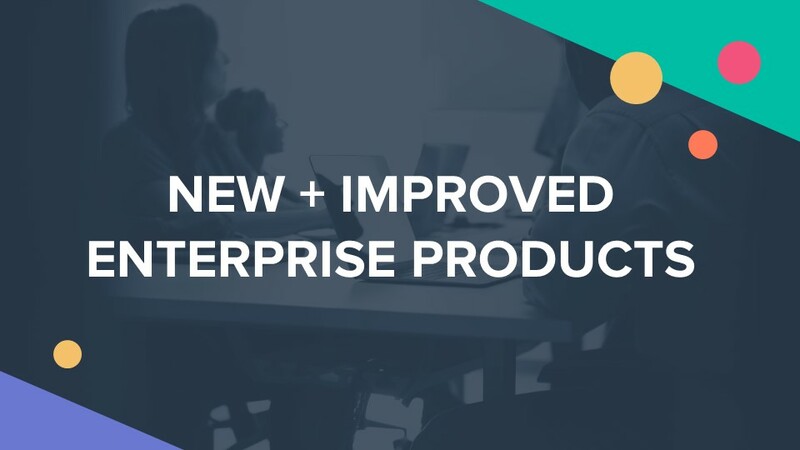 So that's a quick re-cap of what is the sum of many new features that have been rolled out across the platform, specific to marketing hub and for enterprise. So if you're using maybe Salesforce together with Pardot for example, of looking at well how do the Pardot features compare with something like this? Yeah, this is where you would go. For the sales hub, for the enablement of your hopefully inbound savvy sales team, who are not bombarding customers, but are building relationships, using great tools like video. Now video has been built in across the platform, so it's not called out here individually. It's now in there. Within pro and enterprise. I'm using this every day. It's very easy to just bring up a video, instead of just sending an email to say "It was great to have that meeting with you yesterday". It's super easy to just click the video button and just send a video instead. The conversion stats on doing that are incredible. How much of a relationship that builds if you put face to camera. In terms of the sales hub enterprise, much more control over goals, for sales teams and sales quotas and how people are doing against their quota and measuring that. Call transcription and recording is as it sounds. It's there by default in the enterprise platform. So provided that, legally, you're in a situation where you can do it, that it can record the call and also transcribe it for you. So the whole call that you've had is there within your data, if you choose to turn that on. Quote approvals is for the sign off process ,because you can now do quotes within HubSpot, but you probably have management levels, certain value of quotes or certain levels of discount, maybe need to go for VP approval, something like that. An enterprise would want that feature. As with eSignature for getting things signed right there within the platform. This removal of friction, if you think of it in that context, a lot of this is just getting the tools to just do this for you instead of using 50 different tools, which has been a pain in the neck. 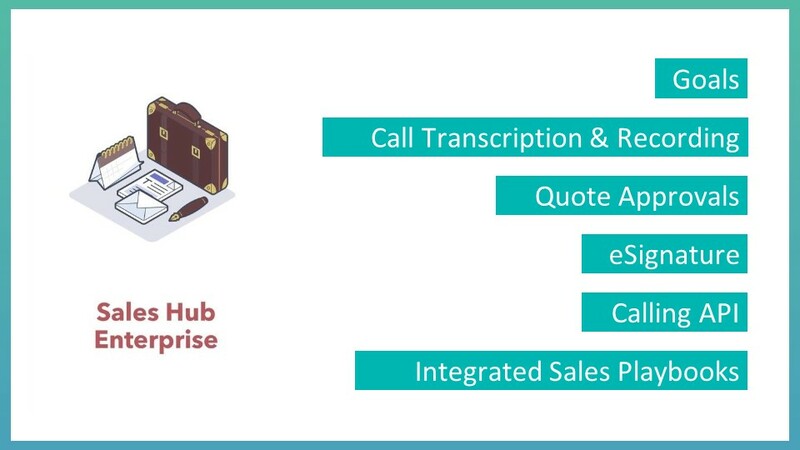 The calling API, this is, if you are wanting the scenario that customers can dial in to you and you dial back out and you're doing that, all through the CRM, it's beefed up the ability to have your full telephony integration within the platform through a calling API. Using tools like aircall ,for example,and there's thousands of tools out there, but the platforms can be integrated in of your choice. And playbooks ,if you're in a medium to large size organisation, there's a good chance you've got playbooks that are guiding the sales team, they're on a conversation with a customer and they find that, oh let's say, they've already got a Toyota car and that's significant ,for whatever reason, in that phone call, the playbook could tell you, here's what we recommend you talk about ,because they've got a Toyota. Just to guide your sales team on recipes for success that are proven. 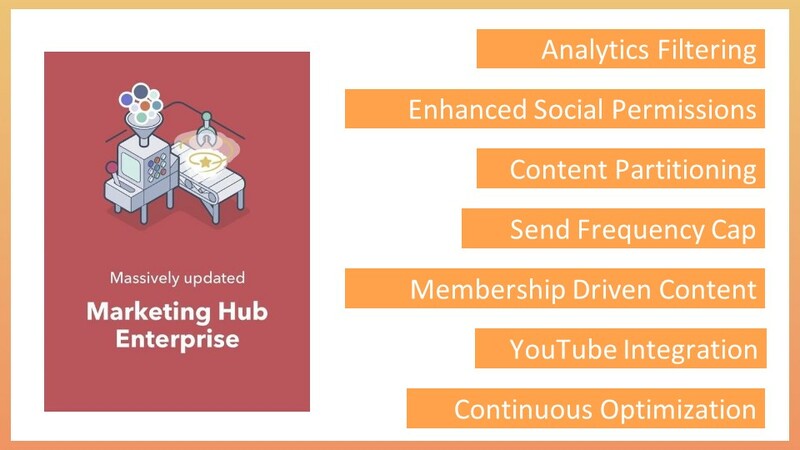 That's a quick snapshot of marketing enterprise and sales hub enterprise. Video is throughout the platform. And because Michael's talking from Vidyard, so by default within the pro and enterprise platforms, you can just click the video button to send video in an email. So it's there for the sales team. It's also there in the service hub platform. And you can host your videos on your site. You can drag a video up into the HubSpot library to host it, the same as you would an image, super easy. I started using it the first day, it was just a no-brainer. And of course you get the play statistics on the consumption of and the conversion of that. The ability to add calls to action and forms right there within the videos. Really cool stuff. 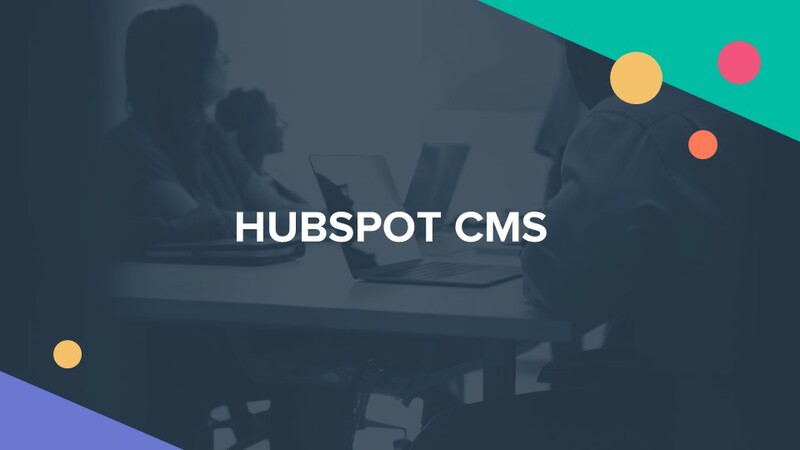 So the hub spot CMS I mentioned, is now available separately, so you don't have to buy sales or marketing or service hub. You can get the CMS standalone, as a web hosting platform. Why would you do that and not base your website on wordpress or some other platform where it is already today, some enterprise or other platform. It's the only CMS that has an integrated CRM. That's a fundamental difference, which makes it very powerful. There's many other features to it, like the built in mobile friendly nature of how it can render the pages, that it's a global content delivery network to keep the speed of the site up, to keep the up-time, to be secure. All of those things that you would expect as well, but it's got a CRM, so it's customer savvy and then you can do cool stuff with that. Like ,if you're an existing client of mine, our website might say certain things to you, but if you're not a client of mine, that same website might say something a little different to you. Think of spotify for example, if you're a spotify customer and you go to the spotify website and the spotify website says "Sign up with spotify today" and you're like, "well, I'm already a spotify customer. You haven't recognised. Yeah, I'd rather your website tell me what the new albums are". So that customer experience means that your website needs to know who the customer is. So that's the hub spot CMS. So one gratuitous screenshot to include of what the feature looks like. But so many features, so many features rolled out over the last six months. On HubSpot academy, this is on a link. If you were to just google "HubSpot updates in less time than a coffee break", it's quite a long url, but easy to find. And so that's HubSpot folks ,explaining each of those features in more detail than what I've covered, but hopefully there's something in there that you've seen that might solve a problem for you today, might really reduce a bit of friction and maybe download those tools to do your own customer code and your own flywheel as some thinking around the year ahead of how you apply inbound in this circular fashion and not have the customer pop out the bottom of a funnel as an afterthought. So the inbound methodology has changed. It's now the flywheel and that's really fundamentally what's new. Hopefully I've given you some insight and some idea of what the inbound event is in Boston. That goes for three and a half days, 330 breakout sessions, so you just can't attend everything, so you pick what to go to, but there's a lot of human stories as well as the technical updates. And this last slide, I'll do a little experiment here. So, we'll be doing our flywheel and publishing that over time. The screenshot on the right is your LinkedIn app on your mobile.
. If you bring up your LinkedIn app, the little search bar on LinkedIn has a tiny little square symbol on it and if you hit that square symbol it gives you your code. So if you meet some people that say "Look, sorry, I haven't got a business card". And you bring up your LinkedIn, you just push that button to bring up your code and you scan each other and you're linked. Someone want to try that? Just just hold your phone up. Yeah. Great. Thanks. Connected. I think that's really cool. That's probably one of the most least known features, in the LinkedIn APP. Everybody's got it. Yes. From your phone camera . And all I've done is taken the Qr code and popped it on my slide. So very neat. So qr codes do still have a purpose. Hanging on by their fingertips as to how they work. So yeah, if you'd like to connect and if I can help you in any way at all , I'd love to do that. And thank you again Clwyd for the opportunity and an update on inbound. Let us know about your experience at previous Inbound events. Put a comment below this post and tell us what you think.